Fountain, Gary, and Peter Brazeau. Remembering Elizabeth Bishop: An Oral Biography. Amherst, MA: University of Massachusetts Press, 1994. 215-218. Bishop was ill with asthma and colds throughout her stay in Seattle. On the evening of 9 March she was struck with a virulent strain of the Asiatic flu. This illness began with a sharp headache, which grew to violent pains throughout her body in the course of the night. She called Dorothee Bowie at five A.M. Bowie ordered a cab for her. As she lay in bed in the hospital, her face was as white as her hair. She left the hospital after several days convinced that she had had a heart attack (although the doctors assured her that she had not) and complaining about the twenty-four-dollar cab ride back to her apartment. 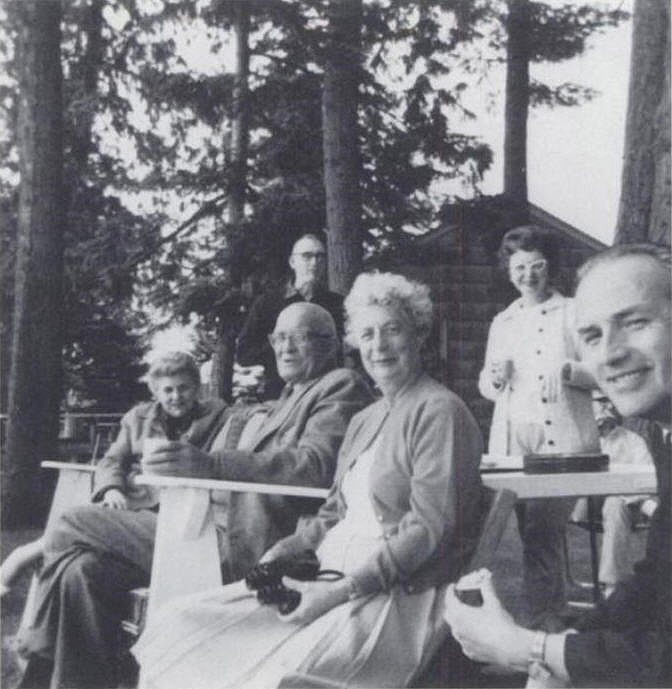 While she was in the hospital, Henry Reed, the colleague who became Bishop's closest literary friend in Seattle, took over her last class meetings before spring break. In his sonorous British accent, he read Bishop's poems, which Bishop herself had refused to do, to her students. Reed had been the visiting poet the year before and had stayed on for an additional year. In Bishop, Reed found a like-minded colleague, a brilliant, knowledgeable litterateur who liked to teach the formal elements of poetry. He and Bishop would get together and complain about the plight of teachers of poetry. They drank to excess together. They also went on a diet together: "They dutifully got their armed forces physical conditioning booklet. Henry would call, 'Well, Elizabeth, did you do your sit-ups?' 'Well, did you do yours?' I don't think it lasted very long; knowing Henry, it couldn't have." [Wesley Wehr interview.] Bishop and Reed had a similar sense of humor, caustic at times, which came across as a snobbish, elitist air to their colleagues. Henry Carlile, William Matchett, a member of the English Department, and Robert Heilman, the chairman while Bishop was in Seattle, recollect Henry Reed and Bishop together. Dorothee Bowie and her son, Taylor, recollect one unpleasant afternoon when Bishop and Reed were uncomfortably sharp with the poet and translator Rolfe Humphries. reader of poetry, though he was often "melancholy," as he put it. Away from campus he drank heavily. Most of his students probably didn't know about his drinking, but I witnessed it personally. I don't know the nature of his severe depression. At the time I suspected it had to do with his poetry. He had published only one slim volume of poetry, A Map of Verona, and a few translations (of Ugo Betti's work, I think). Once, I saw a manuscript on his coffee table. I don't know if it was poems or translations, but it was battered and must have been at least three inches thick. It had been gone over a lot. One time my wife, Sandra, and I went to some trouble to fix a nice dinner for him. He had told me that he missed lamb, so Sandra and I got together a lamb roast dinner for him. When I arrived at his apartment, he asked me to drive him to his doctor's office for an antidepressant prescription. Later, at dinner, he picked at his food, hardly ate anything, and asked to be taken home early. Like Roethke, and later, Bishop, Henry taught forms. He had us do a sonnet, a sestina, a villanelle. Both Elizabeth and Henry deplored the tone that Roethke left at the school. Henry used to say, "If I see the word salmon in another poem..." This complaint was not directed at Roethke so much as at a couple of other Northwest poets Henry disliked. He told me he had written a parody, though he wouldn't show it to me, in which he had managed to use the words clam and salmon thirty-two times. He read it once to another student, but not to me. By this time I think he had already decided it was just a throwaway poem. I loved Henry Reed's teaching. I think he and Elizabeth had similar ideas about poetry. Both were basically modest and precise. They probably commiserated, got together and bitched about the department, the Northwest, the students. In his private comments to me regarding a couple of other students in our class, Henry was very sarcastic. This bothered me at the time, though I said nothing. He was always kind and encouraging about my writing. WILLIAM MATCHETT Elizabeth and Henry were both visitors, both poets, and they were thrown together. Henry had been here the year before, and he was broke and very anxious to stay. Bob Heilman was able to pull together a program that would allow him to teach the Victorian novel and stay for another year. This was really an attempt to solve a financial problem for Henry. He had been very popular in the department and, as the visiting poet, much wined and dined. When the spotlight turned on to Elizabeth the next year, he was a bit jealous and let down. But they soon became friends. He was a wonderful man and fine with some students, but a very lazy teacher. He was an absolute charmer. My wife and I saw a lot of him in London in the winter of 1970-71. Once he came to his door with his finger holding his place in a copy of Vanity Fair. I said, "Oh, Henry, you're reading Vanity Fair," and he said, "Oh, yes, old Bob made me teach it that second year and I've always wondered how it came out." There are lots of Henry stories like that. Elizabeth and Henry may have seemed disdainful of others. Henry was the funniest man I think I've known in my lifetime, but he loved to put people down, in a humorous way. Meeting people was not easy for Elizabeth. Her reticence might have come out as a sense of superiority because people were already looking at her as the great poet. Instead of realizing that she was shy with them, I think they thought she considered herself above them. ROBERT HEILMAN Elizabeth and Henry were real cronies. Their friendship appeared in public often as a kind of a shared superiority to the rest of the world, which at times was not altogether pleasant. Since I never knew Elizabeth well enough to claim her as a good friendHenry I did, because my wife and I saw a lot of himI was always a little embarrassed by this style of everybody else being stupid. My wife and I have a cottage up on Camano Island. Every once in a while we'd have a party or a visit from the summer school people. Once Elizabeth and Henry came up and Rolfe Humphries was there. As a young man Rolfe was a very witty, incisive, and even abusive reviewer. By then he was old and tired. He was a guy that you had to like and feel sorry for. Elizabeth and Henry behaved awfully, wandering off in the corners and snickering and that sort of thing. Snide. I don't know whether Elizabeth got drunk; Henry was always a little bit drunk. I remember being terribly embarrassed. A number of times at parties, my wife and I would be asked to pick Henry and Elizabeth up. They'd get together at the apartment of one of them. Once we waited outside five minutes or so beyond the arranged time of pickup. We could hear them laughing inside and just not bothering to come out. I remember I went in and really lost my temper. I may have been a little harsh about it. Since Henry's career was rather in the wane at that timehe had blossomed much earlier and really wasn't doing much to speak ofa close association with Elizabeth was for him a kind of recovery of some kind of position or status. [This attitude in Elizabeth] would just come out on special occasion[s]. She and Henry brought out in each other that particular tendency to register contempt for the rest of the world. In denigrating the quality of the students, Elizabeth wasn't doing anything all the rest of us didn't do. You only got one bright student per twenty-five. This was her first teaching [position]. The visiting poets are always shocked to find out what students are like. They haven't been around students. They've been associating with other poets and people like that. DOROTHEE BOWIE The party at Robert Heilman's was Elizabeth at the worst I have ever seen her. To this day I don't know what possessed Elizabeth, but she ganged up with Henry and they attacked Rolfe Humphries, a kindly, decent human being. [They were] snide. M. TAYLOR BOWIE They spoke in a sort of a circumspect way, casual comments tossed off that were obviously references. It went on the whole day. It was as if Rolfe Humphries wasn't worthy of being in the rest of our company. I remember particularly how uncomfortable Mrs. Humphries was about it. She seemed awfully dignified and decent. DOROTHEE I was simply appalled at Elizabeth and Henry Reed, a talented but very frustrated man.